Tanya J. Johnson has been a professional in the music field for nearly twenty years. She attended the Governor’s School for the Arts and the Greenville Fine Arts Center. Mrs. Johnson earned her Bachelor’s degree from the University of South Carolina under the instruction of Dr. Rebecca Nagel. 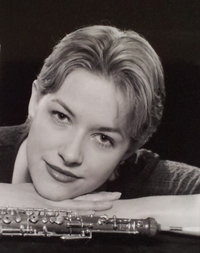 Mrs. Johnson enjoyed a large private studio of oboists and clarinetists, as well as being the oboe instructor at Columbia College and Cameron University. She regularly performed with the Spartanburg Philharmonic Orchestra (Principal Oboe), Long Bay Symphony, South Carolina Philharmonic, Columbia College Wind Ensemble and The Palmetto Concert Band. Teaching has always been her biggest passion and she enjoys helping others experience the fun of playing an instrument. Mrs. Johnson’s teaching experience includes children as young as eight through college and adults.